I have several organization projects floating around in my head. I decided to tackle the smallest and easiest project first. 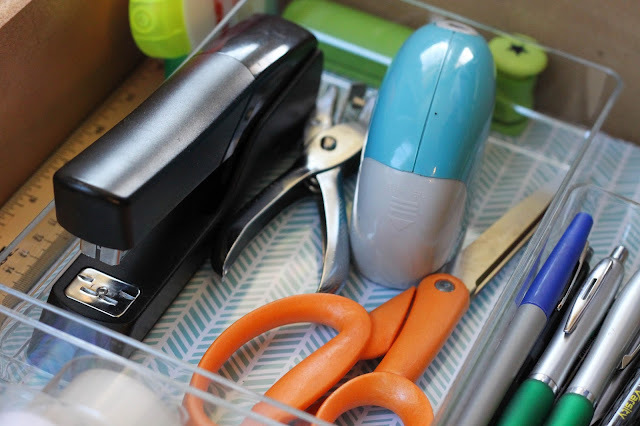 The kitchen junk drawer. Six months ago, I started by cleaning out the entire drawer and going through the contents. It had the most random things in it, and of course I could never find what I needed, when I needed it (I don't have a picture of what it looked like before my first organizational attempt). Out came old expired coupons, receipts, string, small kids fishing kit (I don't know why that was in there), buttons, keys, pens, toys, and much more. I organized the drawer with an old desk drawer organizer that I had since college. It worked for a few days, but it was very shallow, so it could not hold very many of any supply before it would spill into the neighboring compartments. It got worse when the boys brought all their school supplies home and dumped extra supplies in the drawer. Here is a picture before I began my second organizational attempt. My first step was to make a list of what I wanted in my new organization system. -pencils and pens (sharpies will be kept in a higher cabinet until my little boys are older...let's just say there was a sharpie incident on my new ottoman a few months ago and I'm still recovering). My second step was to measure my drawer. I did a little browsing online and checked a few places that I had heard might have some organizational solutions (Dollar Tree, Target and Home Goods). I struck out at these stores so I headed to The Container Store. They have the answer to any organizational challenge that exists. I pulled in and was so excited to walk the aisles, that is until I remembered I had 3 out of 4 boys in the back seat. Never mind, this was going to be a fast trip ;-). I located the drawer organizer aisle and took a look at their selection. I debated between the clear acrylic or the white plastic, but I was really looking forward to lining my drawer in a pretty pattern and the acrylic option would allow the print to be seen more visibly than the plastic option. Here's a fun and useful thing I found at The Container Store. 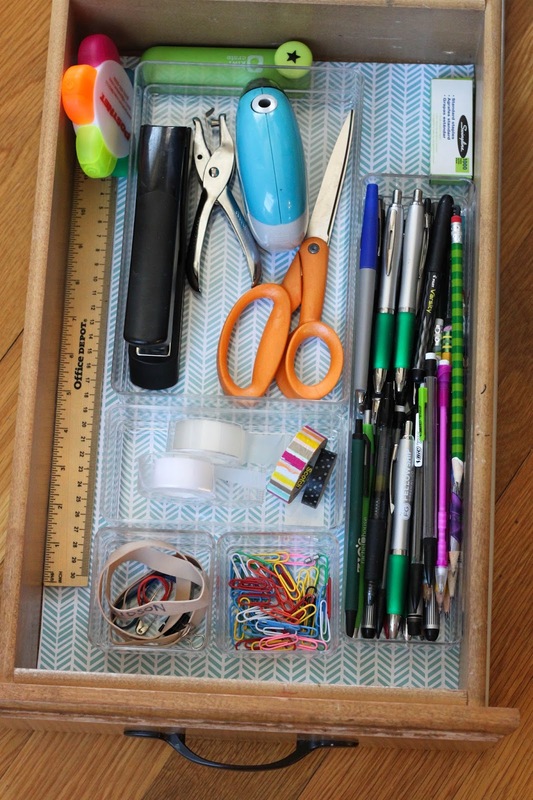 They have a pull out surface that has a mat with rulers down the sides, so you can play around with placement and make sure the containers will fit in your drawer. Genius! So easy, and it made picking out my containers while wrangling three boys so much easier! I used a coupon, paid, and loaded the boys up (after dumping/cleaning Jack's carseat out that contained his entire Cherry Limeade, that he took the lid off of and bumped while trying to get in the van, in The Container Store parking lot...just keeping it real)! I then lined the drawer with Duck Brand Deco Adhesive Laminate Shelf Liner, in Blue Herringbone. I love to open this drawer now, it is so bright, clean, and fun. Every time I open it, it puts a smile on my face. Most importantly, I can find what I am looking for and everything has a designated place. Now, on to my next organizational challenge...stay tuned.